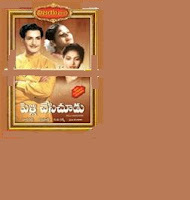 Pelli Chesi Choodu is a 1952 Telugu Drama film directed by L. V. Prasad and produced by Nagireddy and Chakrapani of Vijaya Pictures. This Silver Jubilee Comedy film is based on the social problem Dowry. It was simultaneous made in Tamil as Kalyanam Panni Paar. L.V.Prasad produced and directed the film in Hindi language as Shaadi Ke Baad (1972) starring Jitendra and Rakhee.